This is panoramic view from my phone shows Lake Todos los Santos with pumice gravel in the foreground from a 2015 eruption. Click to get a better image. At long last the rain dried up and the clouds parted. I woke up feeling great despite having food poisoning the previous afternoon. 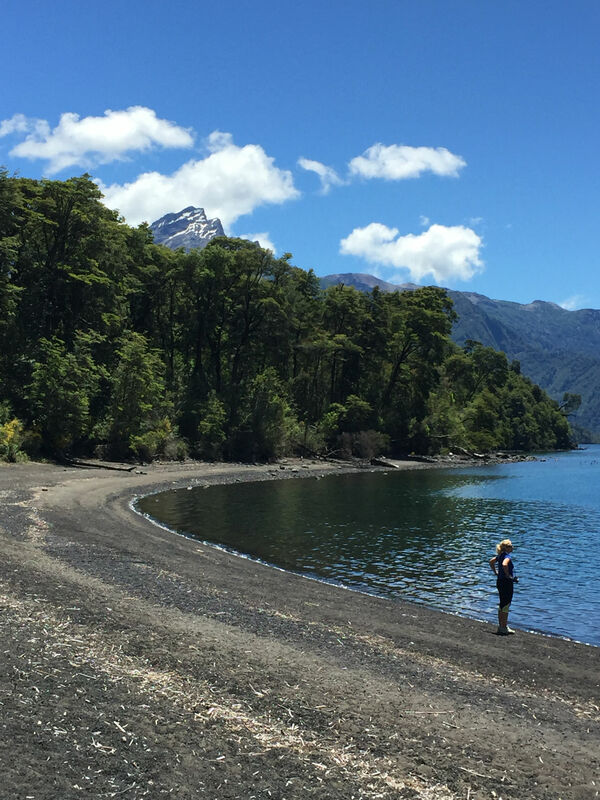 We were on our way around the south side of Lake Llanquihue by 8:30am. Our first foray off the main road was in search of Vicki’s other farmhouse. She had described the location and thought it might be fun for us to try to find it. 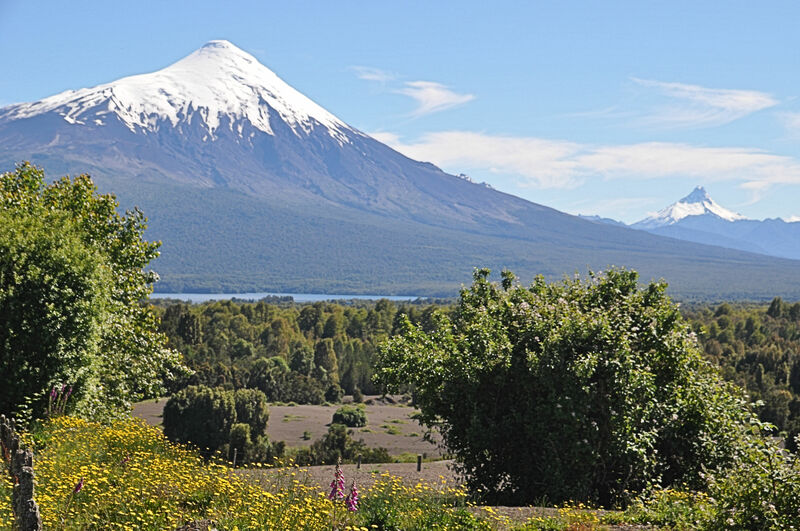 Her farmhouse is on the slopes below volcano Calbuco. 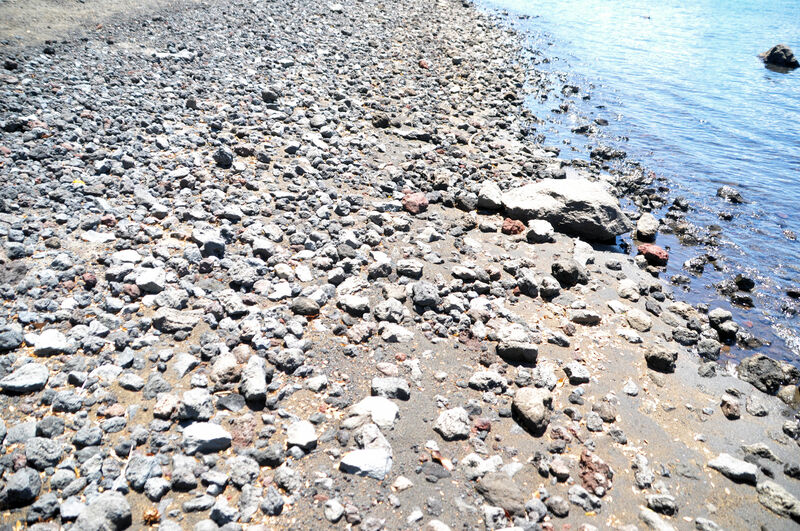 That one erupted April 22, 2015 and is responsible for all the pumice gravel and sand that we had been seeing in the area. Locals enthusiastically described how the area looked like a moonscape just after the eruption, and are amazed at how green and lush everything is already. We got very close, but the place we finally decided was probably hers, turned out not to be hers in the end. We did see some of the clearest evidence of the recent eruption, with wide swaths covered in volcanic gravel. We also saw fenceposts buried about two feet in the gravel, and we could see where snowplows had plowed the gravel off roads, and today the red and black pumice rock berms remain. 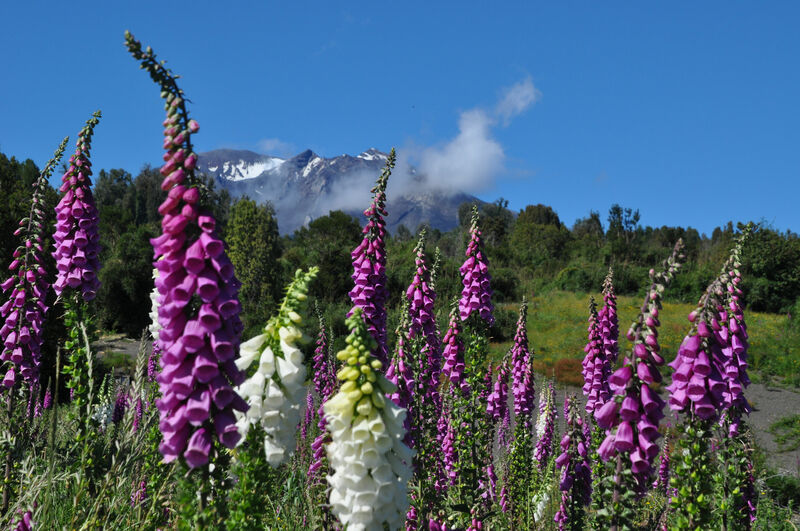 Volcano Calbuco behind flourishing foxglove. 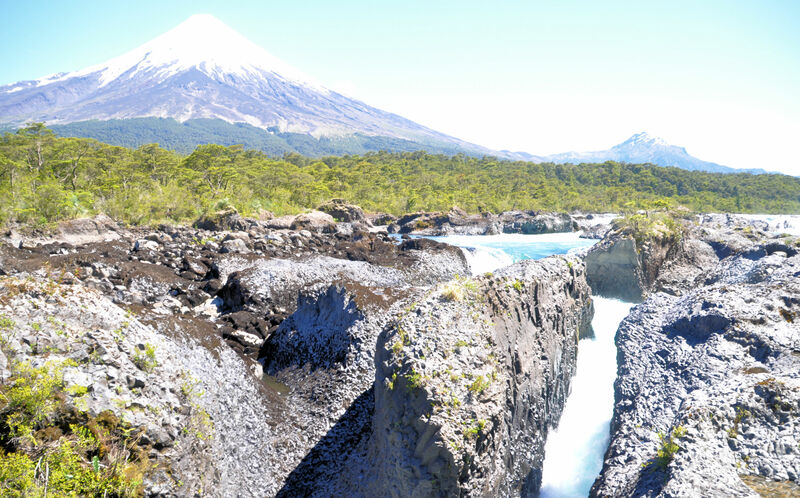 Volcano Orsorno and volcano Puntiagudo from the foothills of volcano Calbuco. 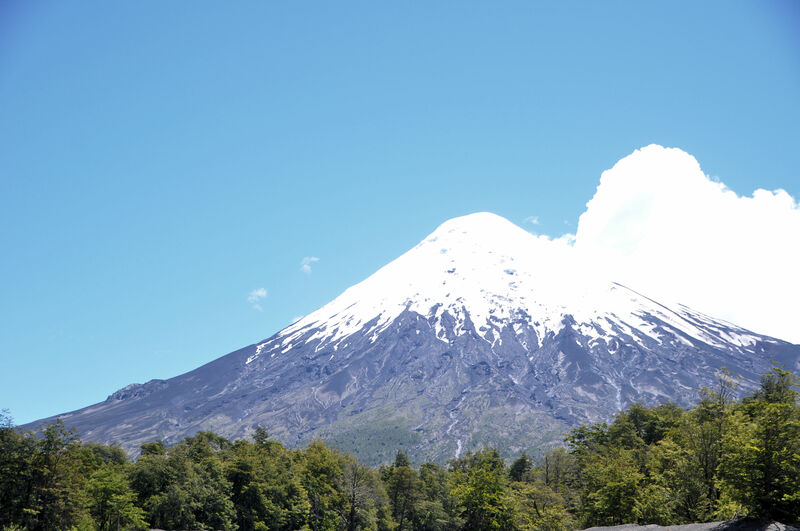 In the video, you can see Margaret with her black coat draped over her shoulders, in front of volcano Osorno. 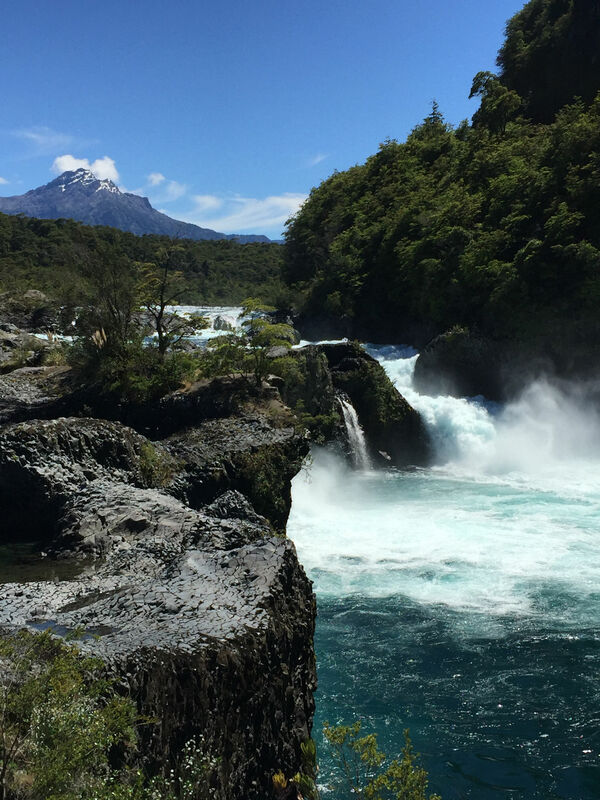 Behind the falls is Cerro la Picada. Cerro means “hill,” but in this case it’s a 4100 foot hill. On the short walking trail we found a tiny lake where we stopped for a picnic lunch. There were trout in the lake, which connects to the river. I took tons of what should have been great photos, but… more camera problems. Everything from the moment when we entered the park – and for the rest of the day – is dreadfully overexposed. I must have accidentally changed the settings to make all the photos totally washed out to almost uselessness. The photos I have posted are a result of drastic photo editing. I just don’t know what happened and I’m really disappointed, because it was so great to have a sunny day again and all the photo advantages that come of that. Drat. Me in front of volcanoes and waterfalls. 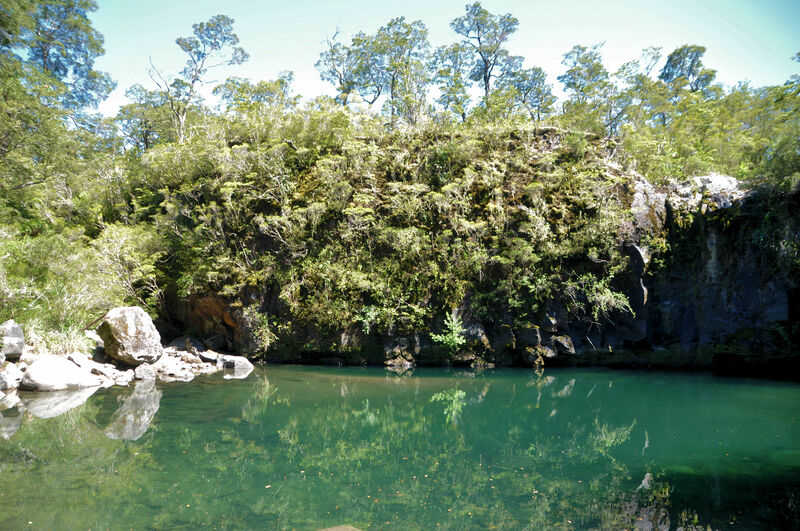 Small pond near the waterfalls where we ate our picnic lunch. On the ridge are Coihue trees, the most common found in Chile. 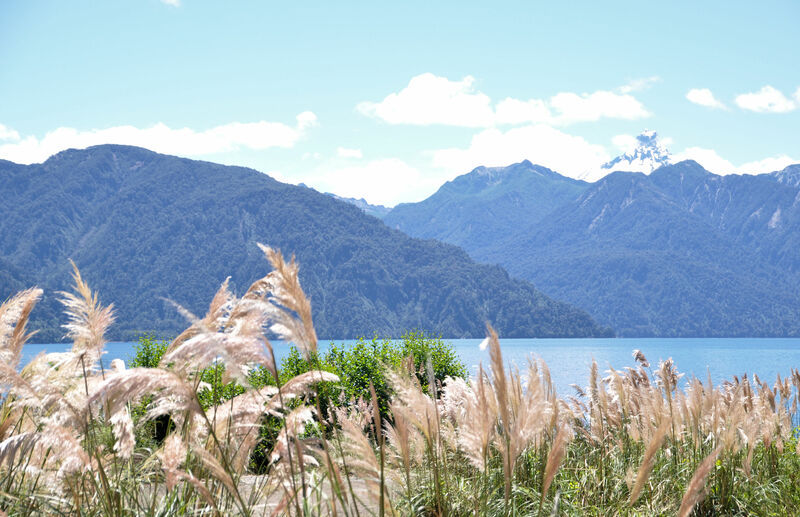 Our destination was Lagos Todos los Santos, which the previous day I had read on two different websites is purported to be the most lovely lake in all of Chile. I thought it had to be at least pretty nice, considering all the lakes in the running. 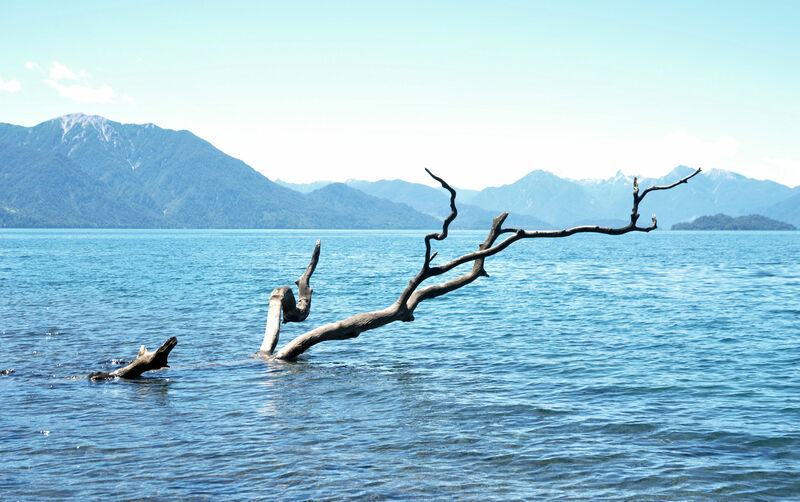 We had not witnessed an unlovely Chilean lake yet. One arrives at the town of Petrohué on the lake in something of a madhouse, with tour busses clogging up every artery and troops of tour employees standing in lanes and parking areas, directing every single vehicle where to park without taking the time to figure out what your intentions are. An attendant waved us to a spot, and as we were about to pull in, another attendant frantically waved us to his area, so we continued on, shrugging apology to the first guy. It didn’t dawn on us till later that the attendants belong to competing tour companies, and want us to park close to their company so they can have the first crack at selling us a ticket to a boat tour. Margaret and I were as yet oblivious, however, and happily continued along the sandy lane, focused first on avoiding the gigantic double-decker tour busses, and second on finding a place to park now that we had left the attendants in our rear view mirror. First other vehicles followed us, then we followed them, all in search of elusive parking, but the trick was to go all the way to beach for copious free parking (estacionamiento gratis). We hailed a bus attendant and asked where “trekking” was (Strangely, this is the word the park officials have been using, so I did too. Possibly another German holdover, since I am pretty sure trekking is not a Spanish word), and were pointed to the trailhead we sought. At the trailhead we saw that Desolación Trail (named desolation for the effects left in the wake of volcanic eruptions in the past, so it was particularly apt after 2015) had two routes at the beginning: one along the lakeshore, and one that was inland. The two routes meet up at a single trail partway up the mountain. We liked the idea of the no-elevation-gain beach route, and struck out that way. Walking along the beach at Todos los Santos. Todos los Santos with Cerro Tronador in the distance. Pumice rocks on the beach. Scotch broom bursting in bloom at the lakeshore. We went along the west shore until we could see that soon we would have to turn along the north shore, and with the map in our mind’s eye, we knew that would not connect us to the trail. We had not seen the trail since we hit the beach, but we had seen enough of the beach. We turned around and decided to go back to town and hire a kayak. In town, the only place that rented kayaks was down to one, and said if we came back in two hours he would have another one for us. In that tiny town there really was nothing else to do but go back to the trail and take the inland route. It was a tough slog because the trail was entirely deep, soft, sand. Every step was work. But Margaret and I are determined women and we kept a good pace and trudged a couple of miles. Trudge, trudge, trudge and had gained about 20 feet in elevation after two hours. We were in the midst of a conversation about whether to keep going when we ran into some other Americans sitting in the shade of a tree having the same discussion. After we talked to them we went ahead on the trail for another half an hour and then gave up. The trail is 11.5 kilometers and we were hoping to get some elevation and get a view, at the very least, but it was not happening any time soon. After all that hiking, I took a final panoramic shot that is at the top of this post. We gave up and went back to Petrohué. By this time I was fully sunburnt, and our hamstrings and quadriceps were hollering complaints about the sandy trail. 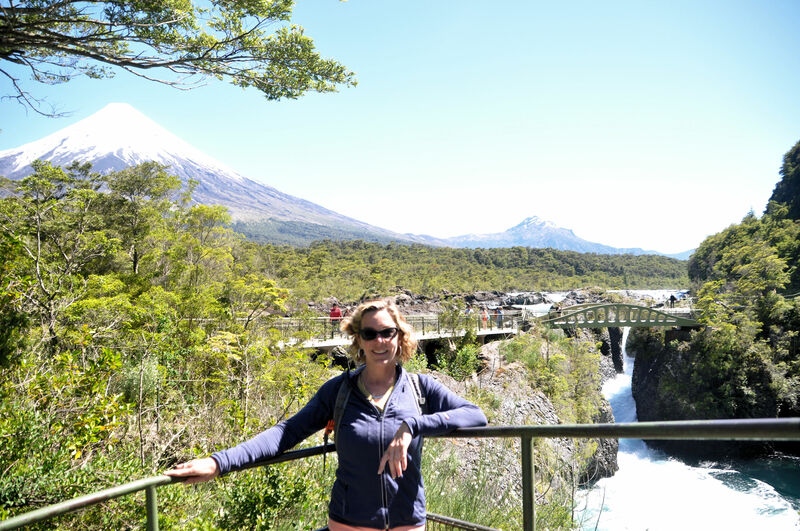 We did not go back to the kayak place, but headed back to Puerto Varas. A final look at the volcano before we turned around on the trail and headed back. This time it was Margaret’s turn to relax. I still had energy (possibly due to sleeping an extra three hours the day before), and took off to explore the town for the first time while M stayed at the hostel and rested. I was in search of something woven from alpaca or llama, but it was late in the day and I had a hard time finding anything open. I decided instead to just explore the town, and struck out for the top of a hill across from our hostel. On the way up, a happy stray dog bounded my way and took up my pace, right at my heels. I walked and walked, and the dog stayed with me. As I climbed the hill, I realized that I could not get down to the lakefront again because there was a cliff between it and me, and no egress. I would have to go back the way I came, or go forward far enough for the ground to slope back toward the shore again. Forward it was, and with my trusting companion, I hoofed it through Puerto Varas. I must have walked three miles, and at a really quick pace because I was trying to get back to my room eventually. The dog finally ditched me in a park once I made it downtown again, and I climbed a long long set of stairs up a pedestrian path back to the Galpon Aire Puro, and bed. I had no idea it was native, so I looked it up. Wow! It truly is from near here. The Pampas region is due east of here on the coast. That is a great tidbit I will probably never forget because, yes, pampas grass is everywhere around here. 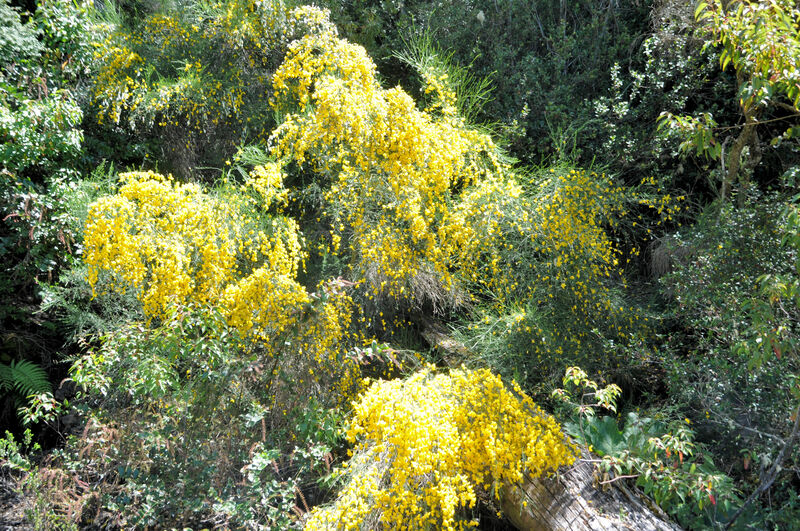 I also looked up the Scotch Broom just in case, and yes, it is also named after its home of origin. Grandson knows his way into your attentions, doesn’t he? Are they staying long? My Tara just arrived home from college, and the house feels more like a house with another person in it. Beautiful! Thanks so much for a great read and sharing your fab photos. Mother nature does good work, does she not?